Walk on the cobbles of Coronation Street, stand on the plinth of the Albert Memorial in London and your feet are on Granite from the Mourne Mountains in Co. Down however there is nothing like coming to walk on the granite slopes of the Mournes for real. Made famous by the Percy French song, ’Where the Mountains Sweep Down to the Sea’, the Mournes are a compact range of mountains in the south east corner of Ulster about a one hour drive South of Belfast and under two hours’ drive north of Dublin. The highest peak is Slieve Donard at 850 metres, but appears more imposing as it does literally sweep down to the sea by the pretty coastal town of Newcastle. 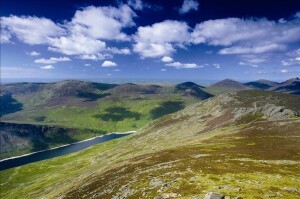 Some say the Mournes are a walkers range of mountains in that they look and feel conquerable, the going is good under foot, and they are easily accessible from a number of points, and made all the more accessible by the Mourne Rambler Bus Service a hop-on hop-off service that travels around the mountains Tuesday to Sunday from May to September. The range can be walked in a day from Newcastle in the North to Rostrevor in the South a distance of 14.5 miles and if you choose the inland spine of the mountains you need never drop below 350 metres. Not to say that a day is all you need to ‘do’ the Mournes, many walkers spend a lifetime time coming back to experience these fantastic little mountains, with so many facets and links to history, literature and geology. The use of Mourne Granite as cobbles and kerbs in English cities has been mentioned and one of the interesting walking routes is the Granite Trail which follows the journey of the granite from the many Quarries in the mountains down the slopes on its own little railway to the harbour at Newcastle.